Jan. 15, 2019: 6 to 8:30 p.m.
Gandhi Mahal, 3009 27th Ave S, Mpls. 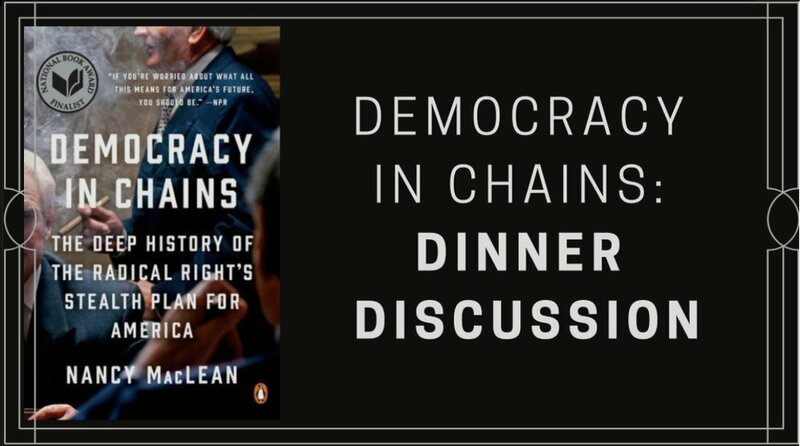 Nancy MacLean connects the dots in her book, Democracy in Chains: The Deep History of the Radical Right’s Stealth Plan for America - a National Book Award finalist. MacLean spells out the Koch network’s secret plans to abolish majority rule and install an oligarchy of the 1%. People will not vote for candidates when their Koch connections are exposed. We can stop the Koch coup by exposing its extremism and its destructive strategies. Their extremist plan includes privatizing health care, schools, social security, Medicare, and eliminating minimum wage laws, taxes on wealth, and most regulations on corporations. Their destructive strategies are rapidly becoming visible: destroy all faith in government, run over fair play like a Mack Truck (on view now in Wis., Mich., N.C.), destroy sane dialogue, create a tone of nasty bitterness, and shred solidarity among the 99%. Speakers will include Carol Johnson, Mary Belden, Polly Kellogg, April Knutson. Co-sponsored by Spotlight Team, Minnesota Alliance of Peacemakers (MAP) and East Side Freedom Library. The Spotlight Team is a group of women determined to shed light on the Koch Network takeover.